From the sea to your walls. Artist and fisherman John Doherty creates fish rubbing art using Gyotaku, a centuries-old technique of painting an actual fish and then rubbing it on paper. 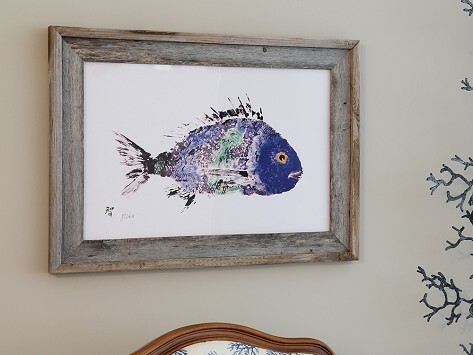 Each bright, detailed print is made on archival art paper and looks lovely as-is or can be accented with a driftwood frame that adds a rustic flair. Most people would be turned off by the mess on the deck of a fishing boat, but John Doherty found it inspiring. After noticing the graphic imprint left behind by a bluefish he caught, John started experimenting with the ancient art of Gyotaku, or fish rubbing. He paints the body of a saltwater fish with water-based paints, then places fabric on top and gently rubs it to make a print. He finishes the piece with a single Chinese character, which he selects depending on the personality of the fish, what time of day it was caught, and his mood when he reeled it in. Centuries ago, people used painted fish rubbings to document different species. John’s prints document his Cape Cod catch, preserving details such as the patterns of fish scales. His prints also celebrate his love of the ocean and marine life. Liz Boksanski, a friend of John, told us about his artwork and we were hooked right away. We love the authenticity of his work and the fact that he sees the process through to the end: After painting, John washes, fillets, and eats each fish. We first launched Fish Aye Trading back in 2012 with a set of four placements. Now, we're also featuring the original artwork on nautical prints and decorative trays with driftwood accents. They’re all a great catch.